If I say that I am getting busier during summer, it’s not an exaggeration. People in cold countries would know that when you are cooped up inside for a long period during winter would like to use every bit of sunlight they get during summer which includes all outdoor summer activities. Kids are approaching their school year end, so less homework make them jump outside as soon as they reach home. I have to keep up with their energy level and the endeavors of gardening. So blogging during summer is quiet tough. Signing up for weekly yoga class had busied up our evening. When we signed up for Yoga, I assured my hubby that it will not be intense and will be some stretches and some poses. The first class itself proved otherwise. The intricate poses made me peek at by hubby each time to check how he was performing the art of yoga. The whole class was reminded by the instructor to do according to everyone’s comfort level than comparing others. The excellent flexibility of our instructor who might be approaching her 50's astonished me. When the first class was over, we met a guy who was practicing next to us. He introduced himself as the instructor's husband who was in the same boat as we were. He told us that the simulations were not easy as everyone thinks. The look on my hubby's face was perplexing to determine if he was happy or not :) The classes are going smoothly now and I think we are doing better than the first class. Before I leave for today's class I want to share with you with this guilt free easy and quick baked potato wedges that you can enjoy for evening snack. Let this be the appetizer for the Memorial Day weekend BBQ. Pre-heat oven to 410 degree F.
Scrub the skin of the potatoes to remove any dirt. Wash and pat dry the potatoes. 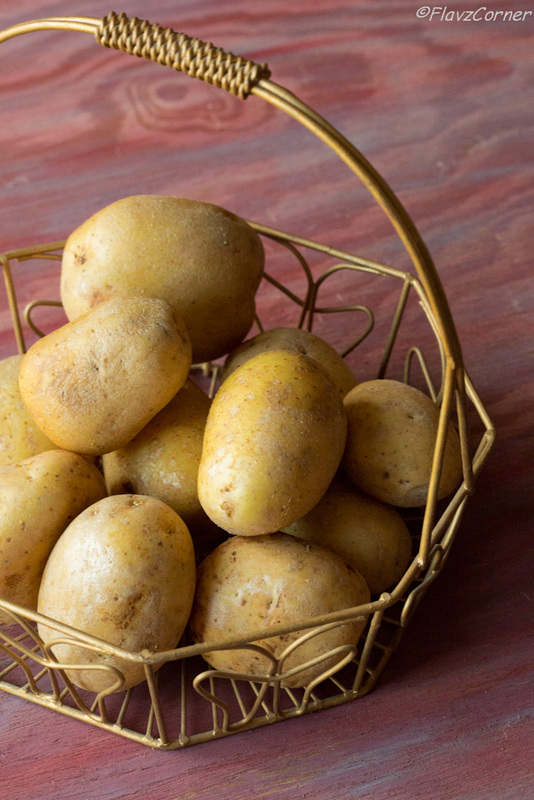 Cut the potatoes into wedges by cutting into half and then cutting each half into 3 or 4 pieces lengthwise. 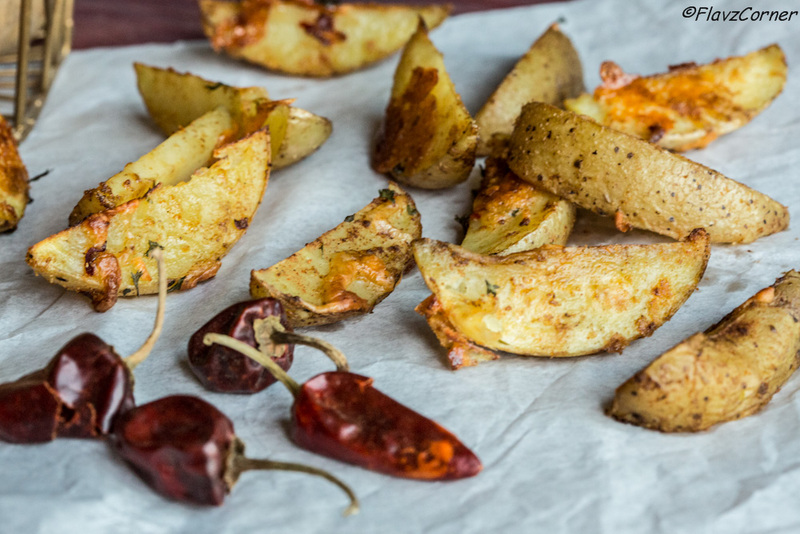 Sprinkle chili flakes, parsley, garlic powder on the potato wedges. Drizzle 2 tsp of Olive Oil and toss well. Now sprinkle the Cajun seasoning just to coat the sides of the wedges as per your taste. Add the 2 tbsp of cheese and toss well. Arrange the wedges on the greased baking sheet with cut side touching the sheet. After arranging the wedges, check if any sides of the wedges don't have seasoning. If needed sprinkle some Cajun seasoning. Sprinkle kosher salt over it. Bake for 15 minutes. Flip the sides and bake for another 5 minutes. Enjoy them while they are warm. 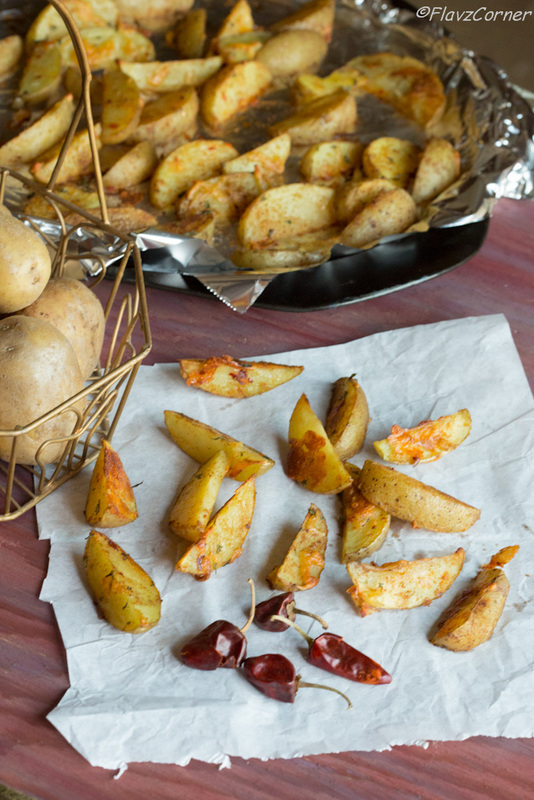 Using golden/yellow potatoes gives the nice color to the baked wedges. I try to use the smaller potatoes to cook uniformly. The baking time may vary depending on the size of the wedges. Please adjust the cooking time according to the slices. The Cajun seasoning is already seasoned with salt, so adjust the kosher salt accordingly. Make sure that you bake it just before serving, otherwise they lose the crunch and taste. Yummy - I love potato in any form...This looks and sounds so good !! I love potato wedges! And Cajun seasoning can be awesome - such flavor! These look great - thanks. And congrats on the yoga - that can be tough!